Occasionally when watching reports on the events in the Middle East I make an attempt at being objective. As a Jewish man, I feel anger any time I perceive Jews as being indiscriminately attacked. It is never pleasant to see any innocent people being hurt, but human nature is that we often feel most passionately when the attack is on one of our own. Be that as it may, I made every conscious effort to listen objectively to both Mark Regev and Hanan Ashrawi on CNN earlier today. Mark Regev, an Israeli government spokesman, naturally was on to portray the Israeli side of the conflict. He explained how the importance of this mission is not only to stop the missiles now, but to allow the southern borders of Israel to live in peace and security in the future. The subject of the “occupation” (not objective quotation marks) never was broached with him as the discussion was entirely about the direction the conflict could go and how to stop the missiles from flying. He made one very important point. Israel has a large Arab population and there is absolutely no way of knowing that these missiles will not injure or kill Arabs and Palestinians, the one group Hamas claims to be fighting for. I am still trying to be objective but as I was listening to Regev speak, I found it increasingly difficult to understand how any sane person would argue with anything he was saying. But then again throughout the ages sanity has never been in the forefront when it comes to assaults on Jewish populations. Objectively speaking. 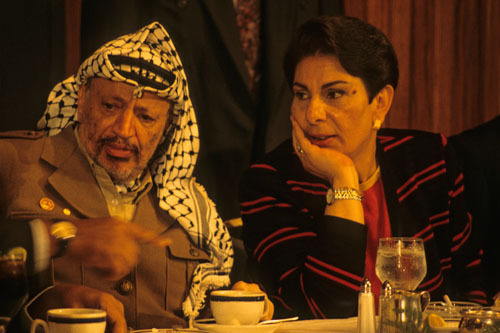 I then listened to Hanan Ashrawi, who as everyone knows only tells the Palestinian side of the story. I have no problem with her doing this since after all, that’s her job, but after being painted into a corner by CNN’s Gary Tuchman, Ashrawi, as intelligent as she may be, in my estimation unwillingly displayed her approval of violence. Tuchman asked her what she expected Israel to do after being victim to hundreds of missile attacks from Gaza throughout the year. He drew the comparison to Florida being attacked by Mexico and rightfully so, said that the citizens of the United States would demand retaliation and that the President would almost certainly oblige his citizenry. Her response was to speak of what she sees as the underlying problem, which in her estimation is the “occupation”. At this point I put on my Mr. Objective hat and decided to consider the “occupation” the real issue here. But when Tuchman continued to push her on what Israel should do about the missiles, she replied something along the lines of, “go back to the negotiating table.” At this point, if my imaginary hat was real, I would have taken it off, lit a fire somewhere, and burnt it to ashes. Ashrawi, who is supposed to be one of the intelligent voices of the Palestinian world, basically revealed the worldwide philosophy among Arab and Muslim leadership today. This philosophy is violently attack until the people you are trying to defeat know that it only stops if you adhere to their demands. Throw missiles at Israel until you get what you want and then cry to the world about how Israel is killing your people without restraint. Well let’s examine that as well. 40 people have been killed in airstrikes in Gaza since Wednesday. That is 4 days of Israeli attacks “without restraint”. It doesn’t take a genius, or even someone objective to realize that if there were 4 days of unrestrained attacks there would be a lot more than 40 deaths. In fact, the reason the number is not larger is because these attacks are focused on what is believed to be terrorist hideouts or bases of operations. When the Arab League gets together to discuss this do they also talk about the 17 civilians, many women and children killed the other day by a roadside bomb in Afghanistan? These people were part of a wedding party and were killed by a bomb placed by the Taliban, an organization like Hamas in its methods and intent. In October, 19 civilians were killed by a roadside bomb. Between these 2 bombings alone 36 civilians were killed. When you factor in the fact that the Israeli attacks are targeted and have killed Hamas operatives, it is pretty safe to say that more innocent people were murdered in 2 roadside bombs planted by the Taliban, a Hamas ally, than by the “unrestrained” attacks by Israel on Gaza. I have heard a few Palestinian spokespersons say that Israel should allow free movement in and out of Gaza. I have a simple response to that. Israel is currently being attacked by Fajr 5 missiles. These missiles are being supplied to Hamas by Iran, the nation that has publicly stated its desire to destroy Israel. With Iran in the process of attempting to construct a nuclear arsenal, and Hamas in alliance with Iran, allowing free access to Gaza would be the equivalent of cutting oneself and walking into shark infested waters. At this point it would be so easy you almost can’t even blame the shark anymore. As someone who appreciates objectivity and hates violence, I welcome the true voices of honor and decency. But both objectivity and peace by definition can’t be one-sided. I am sure Hanan Ashrawi, a woman with multiple degrees in literacy is aware of this, but admitting this would be breaking from the strategy of force over reason and would put her in a position to do something not very politically expedient for her, which is be at peace with Israel.